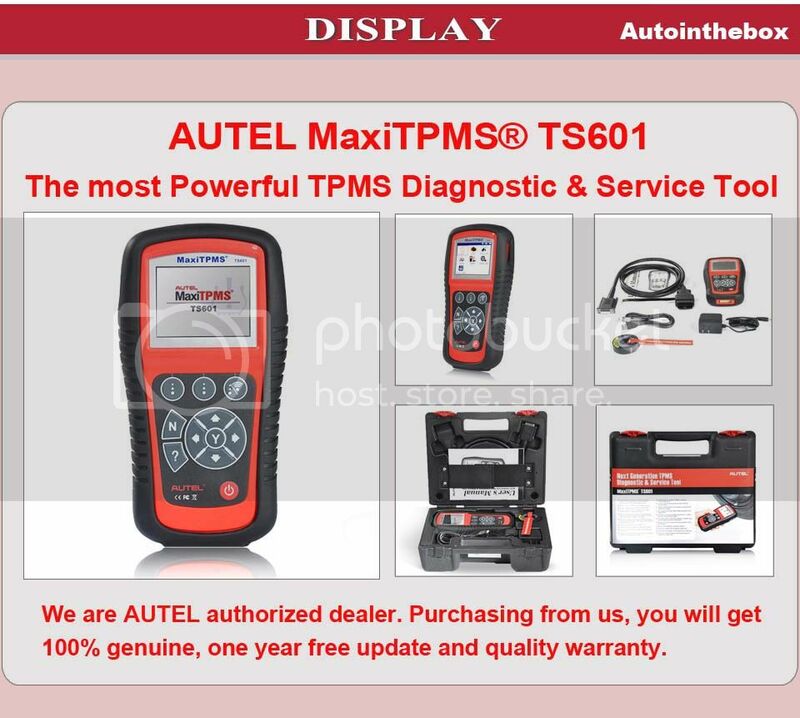 Autel MaxiTPMS TS601 is the most powerful TPMS diagnostic & service tool. The MaxiTPMS TS601 is able to diagnoses TPMS problems warelessly and reprogram the vehicle's ECU. The MaxiTPMS TS601 is a diverse and professional diagnostic device, will offer the best solution for busy tire and automotive workshops. The screen is compact and easy to read direct feedback from all 4 sensors, clearly understand the status of all TPMS features, and compare sensor and ECU data, then instantly pinpoint system faults to identify the fix. With small size feature, it is easy to carry and storage. 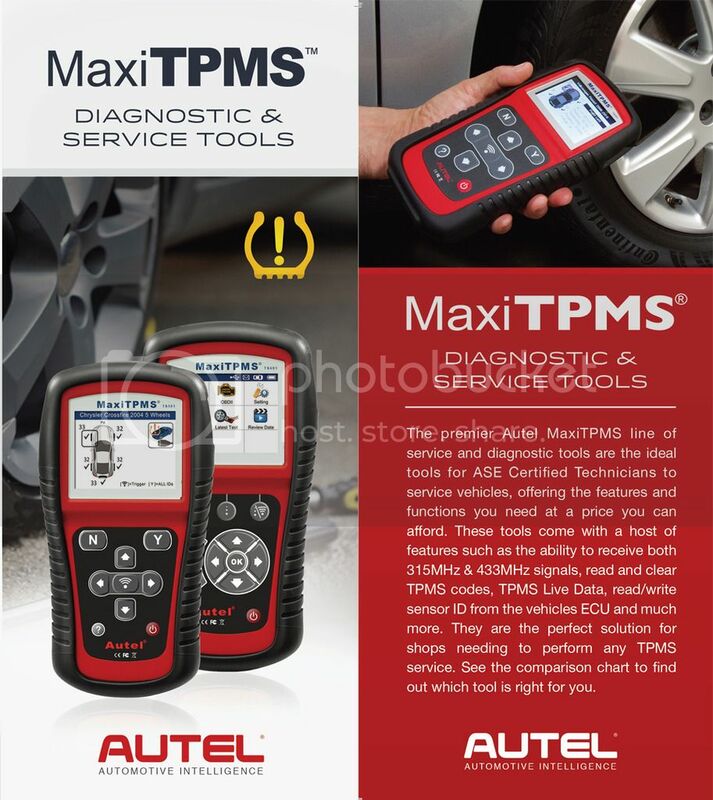 The MaxiTPMS® TS601 is the most powerful TPMS diagnostic & service tool in the world capable of fully diagnosing TPMS problems as well as activating TPMS sensors and reprogramming the vehicle's ECU. This professional tool is the best solution for tire shops and automotive workshops to perform TPMS service! MOST POWERFUL TPMS DIAGNOSTIC & SERVICE TOOL. The MaxiTPMS TS601 is capable of wirelessly diagnosing TPMS problems as well as reprogramming the vehicle's ECU. This professional tool is the best solution for busy tire and automotive workshops that require a diverse tool. The TS601 can provide relearn procedures for specific sensors and connect with the OBDII cord to the vehicle's ECU to offer multiple programming options including clone sensor IDs, or auto create ID, or manual write sensor IDs with no sensor re-learn required for sensor positioning. The TS601 also offers advanced TPMS diagnostics like Live Data Graphing for performance vehicles and complete system diagnostics like Emissions Testing and Live Data Graphing to help technicians complete multiple projects quickly with a single tool. 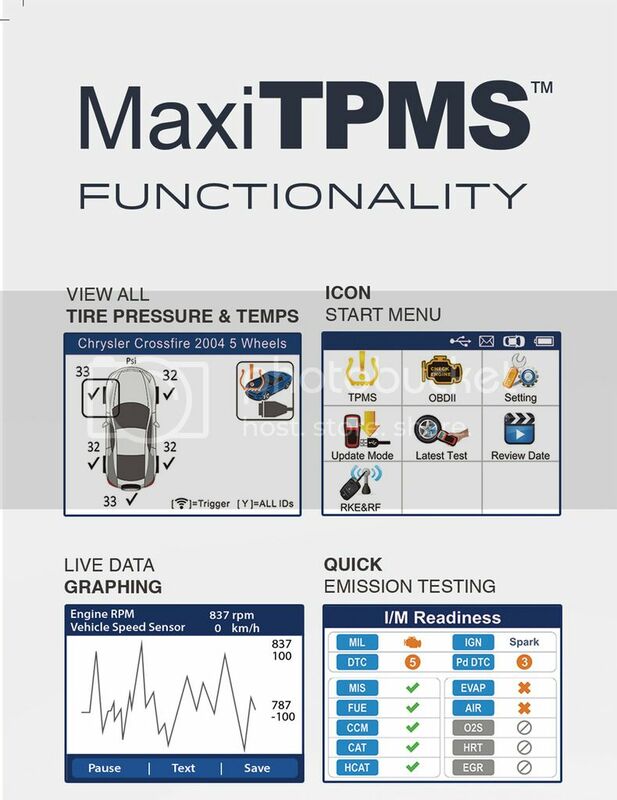 1.The MaxiTPMS® TS601 is the most powerful TPMS diagnostic & service tool in the world capable of fully diagnosing TPMS problems as well as activating TPMS sensors and reprogramming the vehicle's ECU. Q:Will this work on a 2012 subaru impreza? Q:Will it work on 2011 Honda Civic si??? Want to do summer/winter combo. Is this the solution? Q:will this unit pull codes from the tire pressure module? A:Yes it pull codes,calibrate and tell psi in each tire. It also does cel codes. Q:Does the TS601 work with factory oem sensors? Q:The manual says that the programming function will only work with the autel's mx-sensor. is this correct? Q:I just received my ts601 do i need to do any programming before i can use it? A:no, you needn't to do any programming before using it! Q:Will this work with Lexus RX 2016? A:Yeah, any Toyota/Lexus up to '17. Q:is this tool stand alone? Q:Will this work on a 2007 lexus is 250 need to program second set of sensors to computer ? A:I have not used it on that specific vehicle, but it has worked on every Toyota or Lexus vehicle I have tried it on. A:This tool will do whatever you need to solve the TPMS issues as long as you have the knowledge of how to use the information and the tool. A:not sure but I do know it cant collect codes for srs systems that is why I wasnt found of it . Q:dose it write new sensors id for 2009 Ford F150 ? Q:Can this unit read a sensor NOT in a car, copy the data, and transfer it to another sensor BEFORE you put it in the car? Q:What about the difference between ts601 and ts401? TS601 is equipped with OBDII cable, and it has OBD diagnostic functions, such as read/clear TPMS DTCs , which ts401 cannot support. Meanwhile, TS601 can read/relearn/reprogram sensor by OBD but TS401 cannot. Q:will this work with a 2014 q50? A:Yes... Comes with update cd, usb cable, obd 2 connector, charger and case. Q:Can it read abs,srs or eps? A:Dear ROODAL, TS601 is a professional scanner for TPMS. As to your request, we would like to recommend you MD802 that can diagnose all systems (engine, transmission, ABS, airbag, eps and more). Q:I have this tool, need to update! I have already past the one year free update, need to buy a new subscription to update! Do you know how? A:Hello,we can hlep you to update it,it will cost 200USD for one year. Q:I have a 2007 Ford Expedition. Can I use this tool to lower the alarm pressure setting? A:Here are more information found on this product. - Reads, records, and playback TPMS live data, including tire pressure, signal status, temperature, battery status, etc. Q:which is the country of manufacture? A:No it will not. It only relearns TPMS sensors and just reads OBD II dtc's. A:Dear Sam, yes , TS601 can work on a 2012 Acura. Q:Will it rewrite the tpms ids in an aveo 2011 ecu via obdii? A:Autel’s TPMS tool TS601 can activate and read information from all current TPMS sensor frequencies: 315MHz, 433MHz and 434MHz TPMS sensors. If you want to program a new sensor for the 2017 Toyota highlander, only Autel MX-Sensors 315MHz & 433MHz can be programmed with this tool to replace other sensors (including original equipment (OE) and programmable universal sensors). Q:Will it correct Toyota loop issue? A:What do you mean by Toyota loop issue? Q:Will this work with a 2016 Lexus GX460? A:It is in the data base so it should. Q:Will this work global out of USA in UAE-Dubai United Arab Emirates ? A:It will work on obd1 and obd2 systems. Q:Will this work on a 2006 jeep liberty? A:I'm not sure. I have only used the U.S. version on my Cadillac CTS4. A:Hi ROODAL, TS601 is a professional scanner for TPMS, hence it cannot calibrate steering angle sensor. As to your request, and if you wanna more special functions, MK808 will be a good choice for you. A:Dear Kitt Panasy, yes , TS601 can work on your 2010 bmw x5m to reset / relearn the tpms (4) sensors. Q:Will this work on 2012 acura rl? would i need to change the sensors to autel sensors before it works? A:Dear Sam, yes , TS601 can work on a 2012 acura rl. Autel’s TPMS tools TS601 can activate and read information from all current TPMS sensor frequencies: 315MHz and 433MHz TPMS sensors . If the sensor on the vehicle is labeled as 315MHz, select the 315MHz listing on the TPMS tool and you don't need to change the OE sensors. But if you want to program sensors, Autel MX-Sensor 315MHz/433MHz can be only programmed by TS601 to replace to cover over 98% of all OE sensors on the market. Q:Is this scanner able to diagnose and program Latin American Market vehicles? Q:Would it program aftermarket new sensor for a 350Z and will I need any other tool? A:Sharader sensors are OEM. Yes it will program replacements. Scan tool only has to be used to read sensor id's. So yes, a scan tool is needed. Q:Will this work on a 2012 ford f150 and do i need any other equipment to do a tpms sensor relearn? A:Yes it will work. No other equipment is needed. Q:does it work on Subaru? A:I have not found a vehicle this tool will not work on. Easy simple operation. even helped with some troublesome tpms issues. Q:Will this tool Reset sensors on 2015-2017 vehicles? 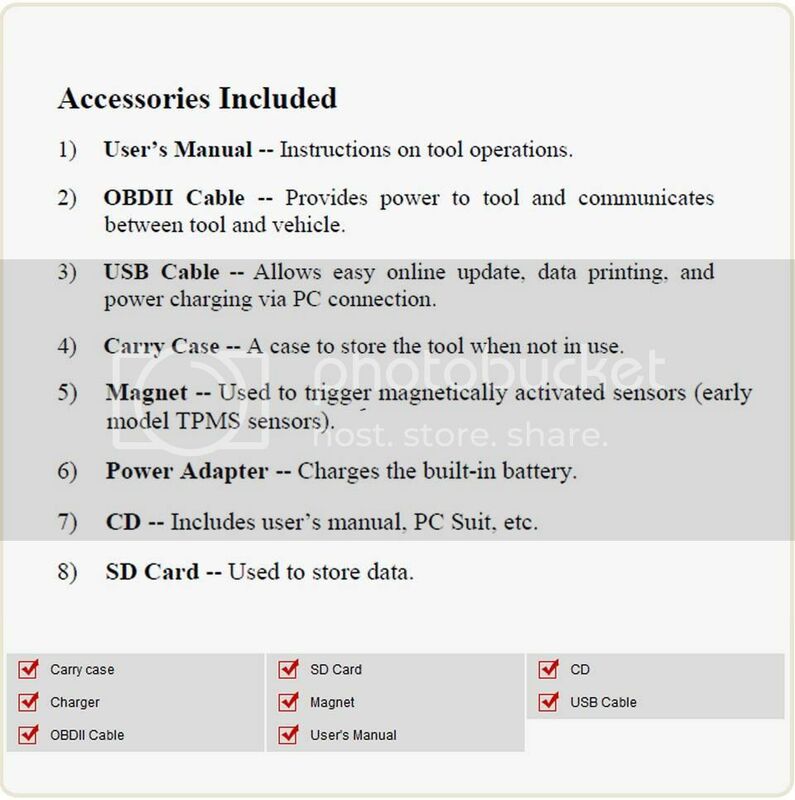 Q:Do you get the whole kit (case w/cables, magnet etc.) for the price? Just the handheld tool? A:It came with the case, charger, cables, magnet and a CD (for updates). Q:Will this work on 2012 Honda odyssey? Q:Will this work on a volvo xc70 2006? have new rims, sensors, and winter tires. A:Dear Jim R, yes ,TS601 can work on n a volvo xc70 2006 with new rims, sensors, and winter tires. Q:Can anyone confirm that this tool will work on (Australian) Hyundai 2017 models? A:Dear STiHigh, yes , this TPMS tool TS601 can work on (Australian) Hyundai 2017 models. Q:Will this work on a 2005 Sequioia? Need to both read IDs and write new IDs to the ECU. Thanks. A:I have actually never tried it on a Sequoia but it does both read and write ID'S. I don't believe Toyota ' s system would be different than any other one out there. Q:Does it write new TPM Sensors ID for 2006 TOYOTA RAV4 Japan? Q:is this tool work with dodge challenger 2014 ? A:I work on a city fleet. Turned on unit, put in Dodge Challenger. Has 4 options. #1 is 01/2011 to 12/2015. It shows that it will, and has worked 100% correctly on anything I used for.I have the latest update. You should get 1 year free updates. I did when bought 12/2014. This tool is great. Hope this helps you. Q:Is this capable of relearning idle throttle body? A:The tool does not do that. That is usually performed by a test drive up to 35 mph on older vehicles. Newer vehicle's have different procedures. Q:Will it reset the pressure limit ? Q:Is this tool have obdii ? Q:Will this read hvac modules for 2005 gm? A:Not sure. I have only used it to reset the TPMS sensors on my 2011 Cadillac CTS. Sorry. A:I do not know the specific models it covers but it should do it. I have done other Mitsubishi models, just not the Triton. Q:Can you check sensors are good before putting tires ,battery good? A:Dear friend ,yes , TS601 will easily show the location of which sensor battery is low and needs to be replaced. Q:does this come with tech support? Q:Can this tool read new oem tpms on a new set of oem wheels a set of 4 i want a set a tires for summer & winter all oem need a tool to reset light. A:It should, but before you program all those TPMS's read manual make sure you understand the tool, because some sensors have to be triggered with included magnet, basically first you trigger and read and copy all sensors, than program them in to your vehicle ECM, but prior to that, you'll need to make equall pressure in all tires, and this tool can program either 4 or 5 tires, and some some vehicles you can program different size of tires to those sensors, (exemple) you change to low profile tires, so you'll need more air pressure, then sensor will be failing to read properly, so this tool can program that too. Good luck. Q:Will this program any universal tpms sensor or just autel sensor ?? Q:Does this include the case, the adaptor cords and any updates? Reads, records, and playback TPMS live data, including tire pressure, signal status, temperature, battery status, etc. A:This unit is for resetting TPMS sensors on most cars. Hand held unit must read one sensor at a time as directed, after all sensors are red, info is then loaded to the Data Terminal with the supplied cable. This unit does not do Cadilac XTS at this time. Q:Is amazon llc an authorized seller, Do I get support and updates? Q:Does this package include the one year of free updates as advertised with other vendors? Q:With ts601 i was not able to wrigt the sesors id to 2006 mitsubishi endeavor any reason? A:Hi, thank you for your response do you mean this model car? Since TS601 scanner is designed to write sensors Id via OBDll cable to the vehicle. A:It should do that car easily, check to see if your spare has a sensor or not. Problem is the seller's Autel's may be out of current updates. I had to send mine back to Autel to be reprogrammed. Now I update on computer, and works fine on every vehicle I've tried. Only pains are spares tucked under suv's. Need to drop them down to identify sensor. You will also need a supper accurate air gauge. A:ts601 support kia & hyundai. Q:What is the different between Husky and Ts601 under size? A:Dear Duy Pham, Husky is named by Amazon, it it the same as TS601. Q:Can this be used to program keyless entry keys, and also do milage reset ? A:No to both. It will only check the remote keys to be sure they are transmitting a signal correctly. It will not reset mileage. Q:Will this work with Jaguar XF 2012? A:Dear friend, yes , Autel TPMS tool TS601 can work on a Jaguar XF 2012. Q:Will this activate and program tpms sensors for 2016 Prius c? Any other tools required? Does it have obd2 cable? A:I think Husky is just SKU for the TS601. Product is the TS601. Q:what includes in the product? Is it include cable, manual or anything? A:Yes, it's include everything you'll need to do the job. Q:can this pull codes from the tpms module? A:Pulls codes and erases codes from tpms module. A:it is in English. However the unit I had did not work so I needed to return it. It did recognize my 2010 Suzuki Kazashi but I could not get the unit to do anything else. I would not waste my time or money again buying a bogus device. Q:what is the tpms 601 come with? A:tool, cable, cd, instructions. I can tell you this is the BEST tool on the market for TPMS and we are VERY happy with it. Takes some limited time to get familiar with it but it does what the others wont. I bought it for a 2012 hyundai and had to program the sensor to the TPMS module on this vehicle. No other tool would do direct programming to modules like this car needed. A:Yes & no, unfortunately. Yes this machine would work/will work, but only with autel's mx sensors. You'd have to dismount your tires, and swap the sensors for the mx's. If the tire shop charged you for a 2nd set of sensors, and the light is staying on/sensors aren't registering, then the sensors ARE NOT working, or they aren't the correct sensors for that jeep. Worst case, have them use the sensors that WERE working with your winter tires. Something isn't adding up. You changed your tires, not your wheels. The sensors should have remained in the wheels.....unless they broke one. Q:Can this relearn all brands of tpms sensors or just aultel brand? Q:Does this coming with the case and the obd2 attachment? Q:Can i preprogram lexus 2016rx sensors with this device? A:Dear Jordan, yes , of course, TS601 supports to reprogram lexus 2016rx sensors. A:No, just basic obd II codes. A:Dear Eddie, yes ,TS601 can work on a 2008 Saab. Q:Can this tool read the TPMS IDs? Q:can this tool reset idle on e throttle cars ? A:If you whant to do profesional service. I recomend to buy it the LAUNCH. SCANNER. I have that one and work very well. I hope this answer should be help you. A:I up date Mine no problems!! Q:Will this learn new tpms sensors to a vehicle? ones bought from napa, oreileys, oem, tph, etc? Q:can I use this tool to program new schrader 33000 ez sensors on a 2009 f150? Q:Will this work on a 2009 Mitsubishi Ralliart? Q:Who knows the advantages of ts601, compared with ts401? 3. Relearn by OBD connection；Read Sensor ID by OBD and copy ID into MX-Sensor. 4. TS601 has the functions of basic OBD II functions. On top of the above, TS601 supports historical test records, supports to print TPMS sensor data via PC and can be updated via SD card (TS401- USB cable). Q:Will this program all tpms sensors prior to installing them onto the wheel? or does it only program autel sensors? A:Hello, this tool can only program Autel sensors. It can't support to program other sensors. Q:How is this different than the autel ts508? they are both about the same price. A:TS601 is more powerful than TS508, TS601 has OBDII function, but TS508 doesn't have. Q:which device would i need to perform a crankshaft relearn on a 2008 chevrolet aveo? A:Crankshaft relearn, I would suggest you refer to Ds808 instead. Q:Will this work on the 2007 audi S8?.. and will it also tell tire temps? A:Yes, Autel sensor can replace the OEM sensor of this car. You need to purchase Autel TS601 additionally to program MX sensor to your car. A:Sorry, it cant support crankshaft sensor relearn. Q:Can this tool permanently disable the tpms system in the ecu? A:I am sorry the current version can't support this function,but it is under development already. You can inform us what kind of vehicle do you want to do and I can inform Autel to develop this kind of vehice in advance. A:Sorry, it is just TPMS tool with OBDII function. It can only read data from TPMS sensor and program Autel MX sensor to replace OEM sensor. Q:Do any of the sensors work on a 2014 toyota highlander xle? A:I no longer own this tool Autel. I returned it to the seller with no hassle. Autel will only work with one replacement brand sensor MX I think. Q:Does ts601 have obd ii diagnostic functions? A:Yes of course, it is just the advantage comparing with other TPMS tool. 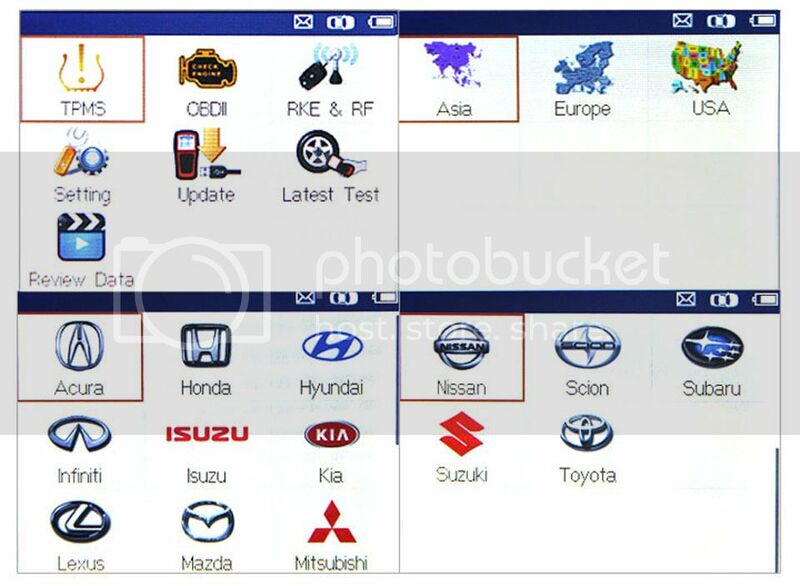 Not only completed TPMS function, also it has the basic OBDII function, which can be used as OBDII scanner. Q:Will the ts601 perform the tpms relearn procedure on the 2012 honda civic si? A:Hello, yes, it can be supported. Q:This says it will activate all sensors using 125khz, most univetsal sensors i know use 315mhz and 433mhz. what about programming those sensors? A:Hello, 125khz is the Receiver frequency of sensors, it is different with 315Mhz and 433Mhz, which are radio frequency. It can activate 99% sensors in the market. And also it can support to program Autel MX sensors. But it can't support to program OEM sensors. Q:Will this work to program oem tpms sensors on 2014 nissan sentra? 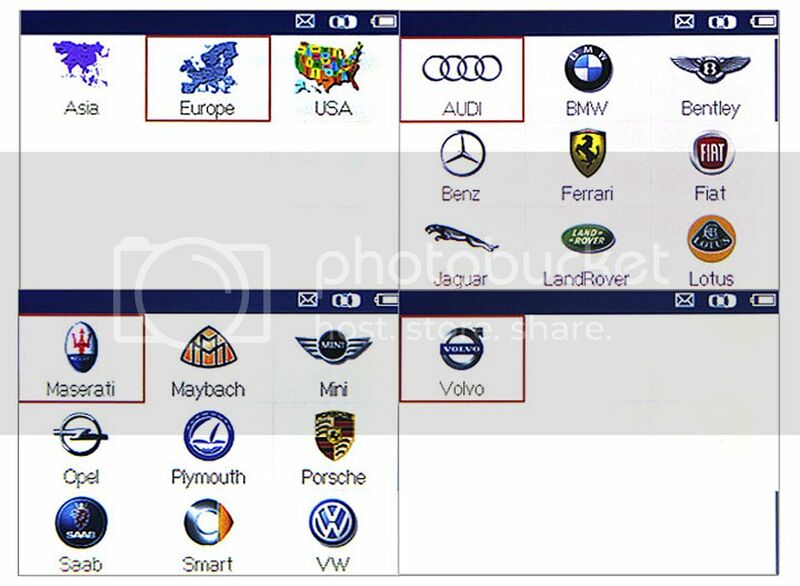 A:Sorry, it can't support to program OEM sensor, but only Autel MX-sensor, so you can purchase MX sensor together with this scanner, to replace defective OEM sensor in this car. Q:Can it program all types of sensors? A:Sorry, it can 't support the all types of sensor, but only Autel MX sensor. Then you can use Autel MX sensor to replace OEM TPMS sensor. Q:is there any difference between TS601 and TS501? A:TS601 has OBDII basic function, but TS501 doesn't have. Q:Can you buy a longer cable? A:I think you can if you go to a dedicated computer store but why would you. The cable provided should be long enough. 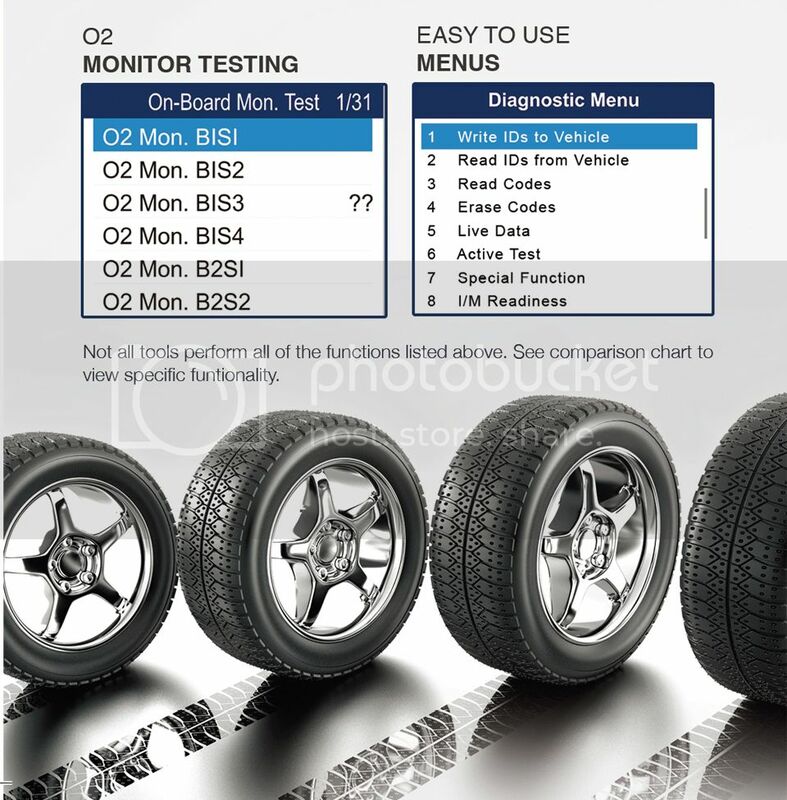 Q:Will this tpms tool do all vehicles out in the industry?? A:You mean program MX sensor to replace OEM sensor, it can cover 90% sensors. Q:is this unit made by Ateq? A:Sorry, it is not Ateq, it is Autel brand. It can support to program Autel TPMS sensors to replace original OEM sensor. A:Yes, sure it can support it. Q:Does it work on Porsche and VW vehicles? Q:Can this reprogram the vehicle to 65psi instead of 80psi for larger tires? Dodge Duallys TPMS are almost impossible to reprogram can it do those? A:Yes, it can be supported. But it is better you can provide us the vehicle model, year and VIN No. for our checking, so we can provide you accurate answer. Q:Do you know where I can buy a update subscription for this tool? A:The updating of TS601 is free of charge. A:Hello, it can work on 2012 FJ cruiser. This car needs OBDII relearn, so if you use TS401, you need to use Copy function to copy the information from the original sensor. Q:Does this work on 2012 acura rl? can it be used to relearn oem tpms sensors? A:Hello, Yes it can support to relearn OEM sensor, like "write IDs to ECU", but please be noted that TS601 can't support to program OEM sensor, but only Autel MX sensor. 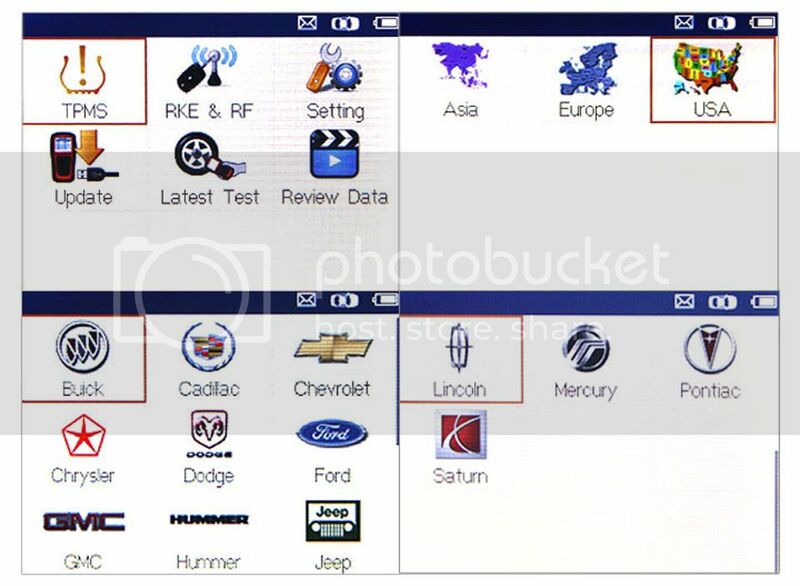 Q:Is it only autel tpms tools can activate the autel sensors? A:There is no such limitation, you can use any tool to activate MX-sensors, but please be noted that only Autel TPMS tools can support to program MX-sensors to replace OEM sensor. Q:Does this scanner only support Autel sensor? A:It only supports to program autel sensor to replace OEM sensor, as for activating function, there is no such limitation. You can activate most TPMS sensors and read data from them, including OEM sensor. Q:Can the mx-sensor be used as oe sensors? A:TS601 can cover to 2017 models. A:Sorry, TS601 can't read ABS. Q:is this original autel product? A:We are authorized Autel dealer. All our Autel products are from Autel company directly. Thanks. Q:Can this tool perform a relearn process for crankshaft sensor from gm express van 1996 5.7l? A:I am sorry it can't support the vehicle in 1996, it can work GM express from 2007- 2018. A:Yes, it can support it. And also if you purchase Autel MX-sensor, you can replace original sensor by programming MX-sensor to this vehicle. Q:Does it work on 2007 Honda Odyssey? A:Yes, sure. You can use this MX sensor to replace OEM sensor, but it is better you can purchase with TS601 together. Only Autel TPMS tool can support to program Autel sensors. Q:Is this their top of the line tpms tool? snapon is offering me their tpms3 tool. how do they compare i wonder. 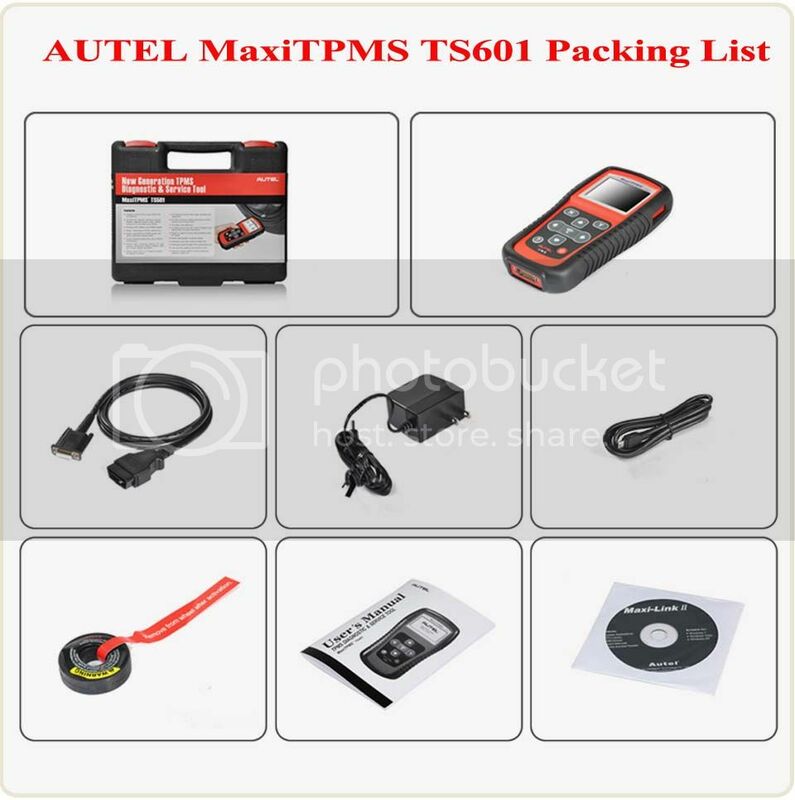 A:Hello, TS601 has the top function of Autel TPMS tool, including OBDII function, activate sensors, relearn sensor ID, program MX-sensor to replace OEM sensor. It is the multi-function TPMS tool for tire shop. As for you mentioned TPMS3, I think you need to purchase additional software to upgrade the programming function, and also it is much expensive than TS601. A:It can suppport to 210 BMW X5 series. Q:Will it work with 2015 Land Rover Defender? A:Hello, it can be supported. You can use TS601 to read OBDII codes and also TPMS ECU codes on this car. What more, it supports to program Autel Sensor to replace OEM sensor on this car, if the OEM part No. is FW931A159AB. Thanks. If you want to know more about this product, please send message to us via Amazon message system. Q:Can you set the pressure alarm levels with this tool? A:Hello, sorry TS601 can't support to set pressure alarm. It is a diagnostic tool which can support to program Autel TPMS sensor to replace the original OEM sensor and also it can has full OBDII function to test your vehicles. Q:will this do a crankshaft position relearn program? A:Sorry, it can't support crankshaft position relearn program, but TPMS. TS601 tool does everything possible related to vehicle TPMS and does it easily. It needs to be registered and updated by Autel after it's received and their USA based support staff is a great help. The ability to read and clear OBD II codes as well as observe a number of live data streams from the engine and transmission are also helpful. Works great only read a few TPMS sensors on multiple cars worked every time have not had a chance to program a new one yet but I don’t see any problem with that. If you plan on using this for multiple vehicles, it is very worth it. A must have tool when you replace your own tires! I have used this product on my 2011 Honda Fit. It was perfect for reading the sensors and figuring out which sensor needed to be replaced on the car. I would recommend reading the manual before you use the product as you can get lost in the menus a little bit. I plan on using it on a KIA in about a week and I hope it works on that vehicle as well. I will update when that happens.<br /><br />If you plan on using this for multiple vehicles, it is very worth it. A must have tool when you replace your own tires! Updating the program worked the first time and it worked on my 2011 Cadillac CTS without any problems! I look forward to using it for a long time to come! It is easily to update for free and easy to use. TS601 is very good and very powerful. This version has both the Tire Pressure Sensor tool but also the OBD reader. It does not just read the codes but also can display the data live. I found the live tracking of OBD data to be quite useful in diagnosing problems. It did take me longer than I expected to figure out the update system, but now it is current with the latest vehicles out there. I was surprised to see such a comprehensive list. I would buy it again if I needed more than one. Pls update it before you using it. After the update, it work great. It could support my 2016 WRX model. You are probably looking into this tool because you got a new set of wheels (in my case, it was winter set) and the TMPS light was on with the new set of sensors. The device is very simple to use. It could program Autel MX-sensors. I want an additional set of winter wheels and tires for our cars. I enjoy the piece of mind of TPMS, and driving around all winter with a tire sensor warning and no pressure readout was not acceptable. Very powerful tool that works perfectly if you know what you're doing. The printed instruction manual is really, really bad, written both for an older version of the firmware and clearly translated with varying success from another language. Awesome unit... has met all expectations so far... easy to use... wide range of vehicles... found this top-of-the-line unit on Amazon for the same price many places charge for the next model down (TS501)... less than $650 (June 2013)... shop carefully! Warning: do not buy from AliBaba/Aliexpress.... bad experience.